Virtually everyone who ever had to take a bath as a small child was likely overjoyed while floating a rubber ducky around the bathtub, whether or not they can remember that far back. Mythic puppeteer Jim Henson could take much credit for making these toys as popular as they are, points out Quaker Gift Shop (QGS). The first reference that may pop into many people's minds when they think of rubber duckies is the now iconic anthem sung by Ernie from Sesame Street who was voiced by Henson. Ernie famously described his yellow bath time companion as "cute and yella and chubby," before adding, "Rubadubdubby." But who originally had the clever idea of creating a cute toy duck specially designed for kids to play with during bath time? 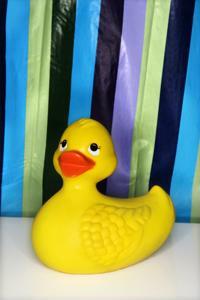 The origins of the rubber ducky are surprisingly shrouded in mystery. Three reputable sources on the topic of rubber duckies report ignorance in regards to who invented rubber duckies or their specific place of origin. However, although there may be more to the story, they all confirm that the bath toys probably first appeared alongside many other mass-produced rubber products during the industrial revolution of the early-to-mid 19th century. The Quaker Gift Shop notes that originally rubber duckies were composed of heavier materials and did not squeak. Rubber ducky enthusiast website Rubber Duck Pond dug deeply enough into the creation of rubber duckies to learn that patents were being filed for inventions that bore similarities to contemporary rubber duckies from 1886 to 1948. Each patent up until the later ones contained elements of what we currently think of as rubber duckies. Saying that Peter Ganine of Los Angeles or Robert Y. Allen and F. Melvin Shaw of Beverly Hills, California invented rubber duckies may be a stretch, but the patents they filed in the late 1940s could indicate that they pieced together already existing concepts into the creation of the toy Ernie would eventually sing about. Like many other children's toys, rubber duckies have evolved into a collector's item for some quirky adults. Ezine Articles point out that rubber duckies resembling the devil and various celebrities have been created with these hobbyists in mind. Take the duckies displayed on Celebriducks.com, where someone so inclined could purchase a rubber ducky that looks like President Obama, Marilyn Monroe or infamous KISS bassist Gene Simmons, to cite just a few examples.